Durban – The tussle for the women’s title in the Dunlop Surfski World Cup Durban next weekend will see two classy South African paddlers who share tantalizingly similar first names square up for what promises to be an epic tussle. Amanzimtoti based Michelle Eder was in rampant form during the summer Varsity College Marine Surfski Series, and has started the winter Discovery Sunglass Hut series in equally dominant fashion. Slight in stature, the 24 year old has developed a reputation as a tenacious competitor who is very capable in demanding surf conditions. 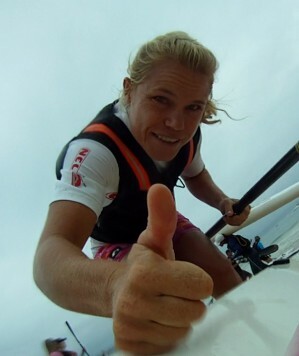 Plettenberg Bay product Michèle Eray is six years Eder’s senior, and since her successful sprinting career took her to Olympic final glory in Beijing, she has travelled the world, setting the benchmark for female surfski excellence as she won virtually every single ski race she entered. Twenty-something Eray won the Dunlop Surfski World Cup last year, reaching the finish at Westbrook beach outside Tongaat a full six minutes ahead of second placed Eder. However Eray’s challenge at the EuroChallenge in Spain last weekend was stymied by a persistent flu virus that dogged her during the race, which was won by compatriot Nikki Mocke. At times her heart rates was topping 170, forcing the gutsy Plett star to paddler well within herself. Whether Eray will have shaken off the flu and it’s after effects in time to peak for the Durban decider will add an air of intrigue to the women’s race, particularly as the typical Autumn conditions at this time of year are more likely to offer flat seas rather than significant downwind swells enjoyed over the last two years. Eder knows the KwaZulu-Natal coastal conditions very well, and is leaning her training towards a tougher grind than the race has enjoyed in the past two years. “I mostly end up doing one longer paddle a week and shorter sessions of about 45min on the dam in the evenings,” she added.